Sometimes the most memorable celebrations and visits with family are not those that involve tangible gifts, a meal, or a trip somewhere. But rather we remember quality moments of time well spent together in joyous activities and shared experiences. Joy of Music Visits are a great way to spend time quality time with family and aging loved ones. These live interactive music visits can connect generations and create memorable moments between people. We play your preferred music requests, we provide rhythm instruments for playing along, and we encourage singing along and sharing memories stimulated by the music. Facilitated by a nationally board-certified Music Therapist, music experiences can be adapted to allow for successful participation by the gift recipient of a Joy of Music Visit. We ask that the family and friends attending this visit is limited to the number of people that can fit comfortably in the visit room location. Visits may be held in the living room of the recipient’s home, common room of a retirement community, or comfortable location within any long-term care facility or rehabilitation center. Joy of Music Visits are an ideal gift for birthdays, anniversaries, holidays, and celebrations among family or friends. 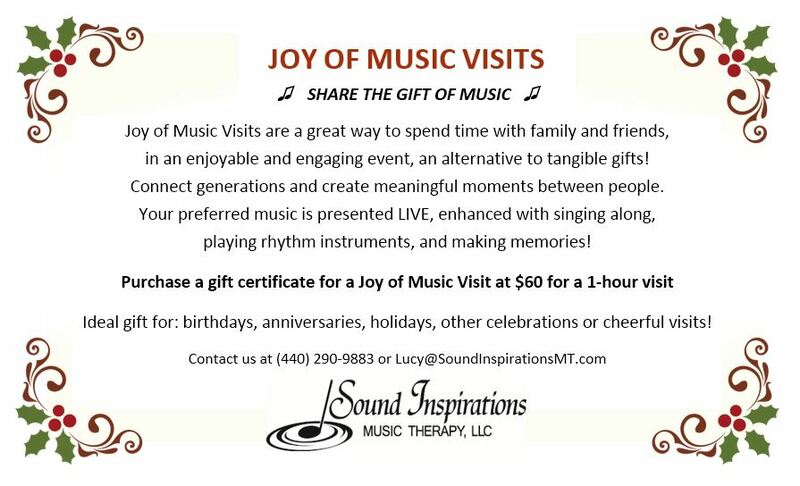 Contact us to purchase a Joy of Music Visit gift certificate for just $75 per 1-hour visit.